Since we are at a dead end at the conclusion of Harbor Road, we will now backtrack a few yards and make our way towards Southport Harbor and Perry Green. Make the first left turn on to Old South Road. You will pass by some pretty enchanting homes on both sides of the streets. Depending on the time of year and the season, the gardens of these homes might be full of blazing yellow daffodils, masses of old-fashioned pink roses or festooned with pine garlands. The low white picket fences allow the passer-by to enjoy the perennial beds and herbaceous borders that these house-proud owners so carefully tend. At the very first intersection on Old South Road, you will come upon Willow Road. 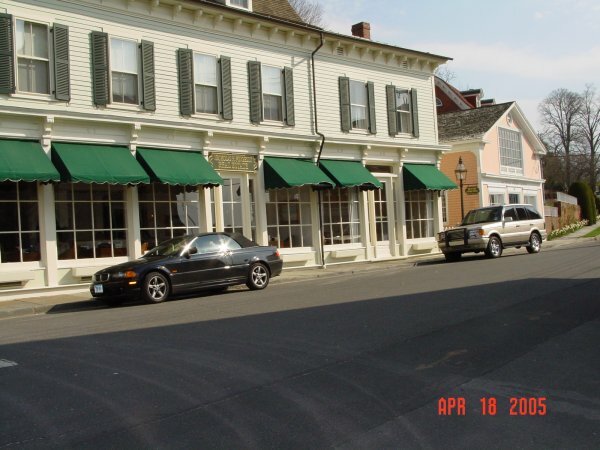 You will notice at this four-way crossroad, old colonial homes with an interesting uniformity in their design. They’re all painted white, for instance, and they all have dark shutters and spacious, wide porches (above). This is Old Southport Village exacty as it may have looked about a hundred and fifty years ago. Nothing has changed in this part of the village and the scene gives the visitor a very good idea of how it might have seemed to have lived in this quiet parcel during America’s Gilded Age. If you wish to, you are most welcome to make a left on Willow Road and walk towards the dead end. If you choose to do this, you will continue to pass by picturesque homes and gardens whose flowers and shrubs are a constant pleasure for me in the summer. At the very end of this road, is the large sprawling estate owned by the late actor Jason Robards and his wife Lola. The home was renovated recently and the gardens were freshly landscaped. Though not much is visible to the passer-by, since the estate is enclosed by high privacy walls and a gate, you can listen to the sounds of the waves as they lap the colorful stone pebbles on the gnarled beach. You will also be able to catch a glimpse of the small lighthouse that is helpful to the many sailors who glide past this spot. Since Willow Road is a dead end, you can go no further. Backtrack towards Old South Road and make a left on it so as to return to Pequot Avenue which lies a few yards ahead. 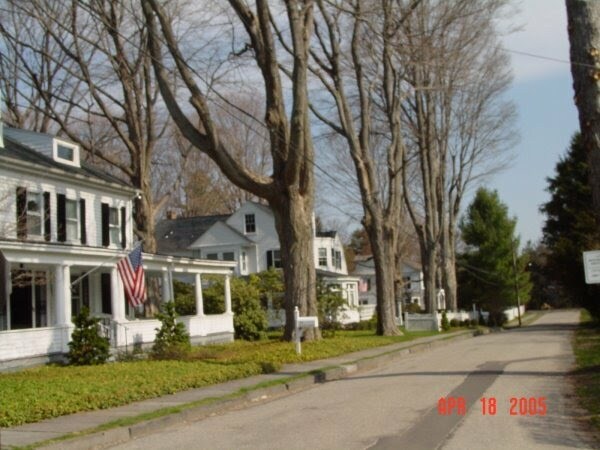 At the intersection of Old South Road and Pequot Avenue, you will be looking at this house (right) in front of you. This lovely home belongs to our friends Dennis and Marlene who are extraordinary gardeners and maintain a splendid garden. 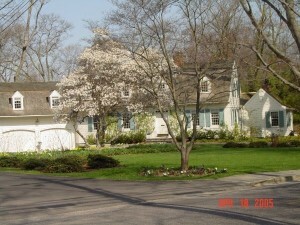 I took this picture in early spring when the white dogwood tree was in full bloom on their front lawn. It sends magnificent blossoms showering down upon the grass. The garden is also full of pale yellow daffodils in the spring and a number of spectacular bright pink tulips. Later in the summer, this same garden will be full of Nikko Blue hydrangeas and vast numbers of colorful daylilies. Marlene spends hours in her garden and is deeply devoted to it. Its not just the garden that is a joy to behold. Look at the house. It is so beautifully constructed that it seems to wrap around the lot. Its pale blue shutters give it the look of a cottage in Provence. I love this part of Southport and I’m sure you will feel the same way too when you round this corner. You can now make a left and walk down Pequot Avenue all the way to the Beach which you will reach in about five minutes if you stroll at a slow pace. Every single home on this main avenue is a beauty. Take the time to observe the special New England architecture that gives this region its very unique charm and flavor. You will know when you are have arrived at the beach for you will smell the salt tang in the air long before you see the sparkling stretch of pale golden sand. It is not unusual to find ducks, seagulls, mallards, and a number of feathered friends in this area. Clams are plentiful along the sandy shoreline and gulls swoop down on them every time the waves recede and their shiny shells are exposed. If you decide not to walk to the beach, however, you will make a right on Pequot Avenue and head back to the Village Center. At the first intersection of Westway Road and Pequot Avenue, you will see the distinctive castle-like building (left) that is Southport Village’s most beloved landmark–the Pequot Library. Dating from 1876, the library is sometimes referred to as “The Arches”, thanks to the three arches built into the front entrance. The stone exterior of the library has an interesting pink glow, matched by the red tiled roof line. There are stained glass windows and very interesting, antique fixtures in the Library and a visit inside the building is very highly recommended, time permitting. The library serves the Village residents superbly. In addition to offering a wealth of books, magazines, videos, etc. it also has a very valuable collection of antique manuscripts. Its community activities which include everything from musical concerts and recitals to book discussion groups to elegant fund-raising dinners in large tents on the front lawn, bring the community together beautifully. It is, however, the Annual Summer Book Sale for which the library is best known. Held in the last weekend every July, the sale attracts bibliophiles from all over the country eager to get their hands on a priceless find or a dog-eared paperback. Children flock to the kids section to pick up their stock of reading material for the entire year, taking home books by the cartload. Both Llew and I are year-round volunteers at the Library. We sort, price and box books that are donated to the library and which eventually find their way under the two huge tents that comprise the sale. Over 100,000 books are sold each year at the sale, raising at least $125,000 for the library. Walking past the library, on your right, you will come upon the white spire of Trinity Episcopal Church, a truly lovely white clapboard covered building set in the most charming front garden. This was the same church that we spied from a distance while strolling on Harbor Road. Trinity Church was constructed in 1737 and has served the community ever since. Between 1737 and the American War of Independence of 1776, it became the leading Anglican Parish in Connecticut. In 1779, however, as the British swept through the Town of Fairfield burning every colonial building in their wake, Trinity Church was also burned to the ground. 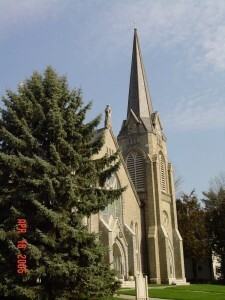 After holding services for over fifty years in various venues, the parish purchased its present site on Pequot Avenue and consecrated it in 1856. If you have a moment and you find the church door open, feel free to visit the interior of one of Connecticut’s oldest and most historic places of worship. If you choose to walk past Trinity Church, cross Center Street and continue down Pequot Avenue. The houses on the right side are among my special favorites in Southport. I love their design, their gardens and the feeling they exude of old-fashioned luxury without any trace of ostentation. On your left, you will now see the grey stone facade of the imposing Southport Congregational Church (right). 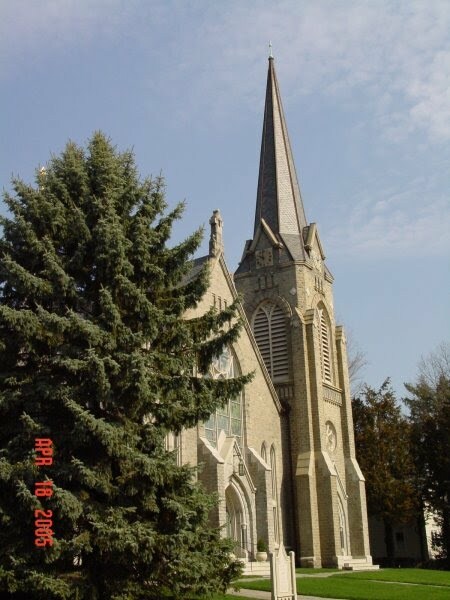 In fact, while Trinity Episcopal Church existed long before the Congregational Church did, Trinity only moved to its present venue on Pequot Avenue a good 13 years after the Congregational Church had been offering services to the community out of a wooden building on the same site. 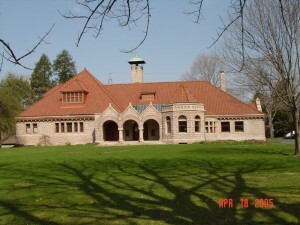 The current stone structure was completed in 1876, making it contemporary with the Pequot Library building. Again, if the inclination takes you and the doors are open, you are welcome to tour the interior of the church that boasts some magnificent stained glass windows You might just hear the sonorous boom of the organ, if choir rehearsal is in progress. Oftentimes, we see beautiful limousines parked in the lot opposite as the church is a popular venue for weddings. Bridal groups pose at the main door as the facade makes an evocative backdrop for wedding photographs. Among its many community services, the church runs a thrift shop year-round in its premises attached to the church yard behind. I love to scour through this treasure trove of ancient finds as I never know what I might chance upon–a 1950s blender possibly part of a long-ago bridal trousseau; framed Currier and Ives prints depicting the four seasons in New England or a vintage Chanel bomber jacket in pure silk.When you have availed yourself of the peace to be found within these quiet environs, you can make your way back to Pequot Avenue, turn left and continue to walk towards the Village Center. On your left hand side, you will shortly pass by the Southport Post Office, a very quaint, small, low-slung building where stamps might be purchased, parcels posted and mail retrieved. All Southport residents know their mail carriers personally and by name and will often spend a few minutes chatting to them while their mail is delivered to their mailboxes on the curb. Right behind the post office is Southport Railroad Station where commuters get on to trains going towards New York City or towards New Haven which is the end of Metro-North’s Red Line. Walk past the post office and find, on your right hand side, the Horseshoe Tavern, Southport’s own little neighborhood pub. A perfect watering hole in the middle of the village, it serves a swift half if that is your desire or some very tasty pub grub if you’d like to settle down for a meal. My friend Brooke Aymar had been tending bar at the Horseshoe for years. If you do decide to wet your whistle at this spot, do say hello to her. In the same row, adjoining the Horseshoe Tavern are cute boutique shops such as Barbara Barbara which offers exclusive gift items, The Classic Room which provides superb traditional custom-designed interior decorating services and Salon Grace where fashion-conscious ladies can get their tresses coiffured. This will bring you back to the Village Center where you can partake of a refreshing drink at the Driftwood Cafe on the corner. I do so hope that you have enjoyed discovering my beloved village of Southport in my company. I hope this will not be your only visit. Each time you return, you will be in for a fresh treat because the village is impacted greatly by the changing of the seasons and the time of year. What it remains untouched by are the tides of Time. In fact, if you close your eyes and disregard the modern cars parked on the streets, you could easily stray back into the 1800s. Now you know why I love Southport so much and why I consider ourselves truly blessed to live in such a protected parcel of the state.